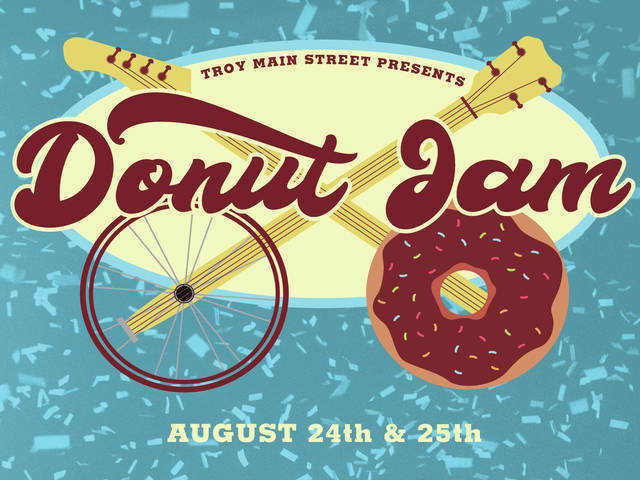 TROY — Downtown Troy will be the hub for all donut and music lovers on Friday, Aug. 24, as Troy Main Street hosts the Donut Jam Music Festival. This free, family-friendly event kicks off at 5 p.m. with musical performances, children’s activities, and drink sales. Soulful singer Meghna is the opening musical act for the evening, followed by Funky G & the Groove Machine. At 8 p.m., The Buckeye Donut Dash will take the stage to host its first annual Donut Eating Contest. The public is invited to cheer on some of Troy’s finest as they devour unheard-of quantities of donuts while participating in this messy event. Once the full-bellied winner is announced, one of Dayton’s most popular cover bands, Hey There Morgan, will jump on stage to rock the night away. Children’s activities include a bounce house, face painting, and a photo booth. There will also be donut-themed activities, miniature golf holes, a learn-to-kayak area, a 2,200-gallon aquarium, and a giant game of Operation. Free donuts will be available to both children and the young at heart. Moeller Brew Barn will be on site to offer donut-flavored beer in addition to their craft beer options. Non-alcoholic drinks will also be for sale with proceeds going directly to Be the Match, an organization that provides funding for patients in need of bone marrow transplants. The Donut Jam will be held from 5-11 p.m. Aug. 24, in downtown Troy. The next morning, the public is welcome to cheer on cyclists in the Tour de Donut bicycle event, participate in the Buckeye Donut Dash 5K, or enjoy more musical entertainment and children’s activities, including a visit from the Columbus Zoo. The Farmer’s Market will also be running Saturday morning from 9 a.m. to 2 p.m. The Donut Jam is hosted by Troy Main Street, Inc., a 501(c)3 organization. This event is made possible by the generous support of The Troy Foundation, Kettering Health Network, Premier Health/UVMC, Alvetro Orthodontics, Excellence in Dentistry, Miami County Visitors Bureau, Unity National Bank, Beckstrom Orthodontics, Greenville National Bank, MAK Dental, US Fish and Wildlife Services, and The Valley Church.